Students from Barnsley College were acknowledged for their outstanding achievements at the seventh annual Barnsley College Excellence Awards. 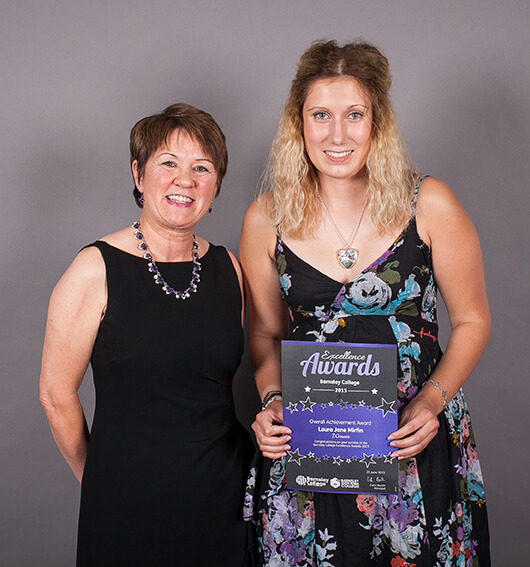 On the night the Overall Achievement award was presented to one student selected from all those who won an award during the evening and this year’s overall winner was 18-year-old Laura-Jane Mirfin, of Hollinswood Grove, Cudworth. Laura, who is an Electrical Engineering student, was the winner of the Volunteer of the Year Award and impressed the judges with her dedication and enthusiasm. She has become an outstanding ambassador for Engineering, volunteering at events, attending open days and founding the society ‘Girlineers’ inspiring other female learners in Engineering. Guests enjoyed a three-course meal, prepared by Glorious Catering, at the sponsored event and were entertained by students from the Media, Music and Performance department and Barnsley Sixth Form College, including Barnsley Community Choir, musicians, singers, dancers and an acoustic rock band. The keynote speaker for the evening was Dr John Foster MBE, the Managing Director of multi award winning Fosters Bakery, a family-owned business since 1952. John gave a passionate speech about ambition and encouraged the students to be proud of their roots. The event was made possible through the kind support of many local and national businesses including Barnsley and Rotherham Chamber of Commerce; ASOS UK; BAM Construction; Barnsley Chronicle; Barnsley Council, Barnsley Premier Leisure; Bond Bryan Architects; Blackford Sports; City & Guilds; Ellisons; Glorious Catering; JCI Barnsley; Holiday Inn Barnsley; HK Projects; Osborne Technologies; Net Natives; Premdor; South West Yorkshire Partnership NHS Foundation Trust; Sun Healthcare, Turner and Townsend, and University Campus Barnsley.